Wednesday night, April 30th, is the Dallas Summer Musicals HS Musical Theatre Awards show. All of you that purchased a ticket for the show will be released from class at 3:00 that day. You will then come down to the theatre room to eat and get ready for the event. Dress code is formal – homecoming/prom dresses for girls & suits or tuxes for guys. 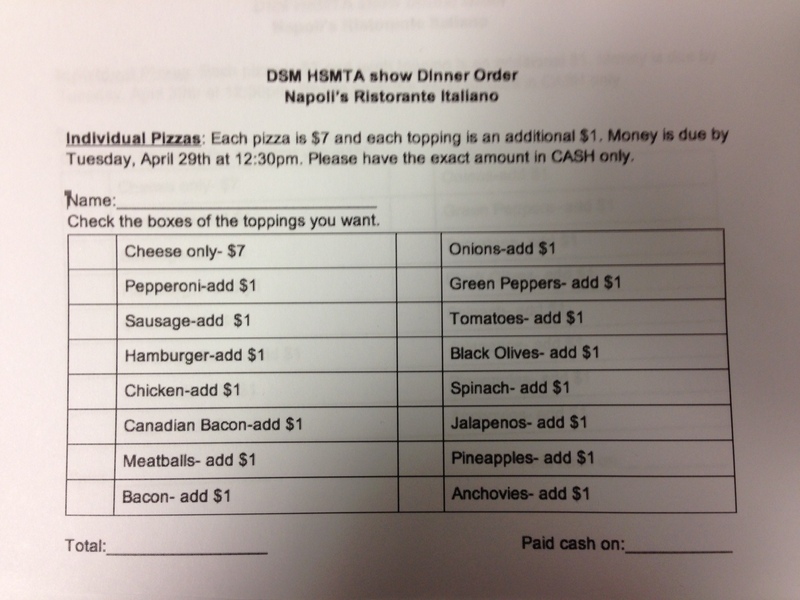 You have the opportunity to order an individual pizza from Napolis to have for dinner before we go to the show. To have your order placed, you need to print off the order form below, fill it out and turn it in with complete cash payment to either Mrs. Howe or Mrs. Leffel by 12:30pm TOMORROW (April 29th). Pizzas start at $7.00 for cheese and add $1.00 for every additional topping. They are 10″ in diameter and are cut into 8 slices. You can have one to yourself or can share with a friend.